Sandat suite has its own entrance with balcony. This room has a king size bed, digital security box and enclosed insect proof, ensuite bathroom. There is also a sofa which converts to a double bed for 2 children sharing. Boutique 3 suite only with private pool, tropical garden Jepun suite has its own entrance with balcony. This room has 1 Extra King bed (240×200) or 2 king single beds (120 x 200) with digital security box, enclosed ensuite bathroom and TV and DVD player. Contact us direct OR book now for your holiday in Ubud. 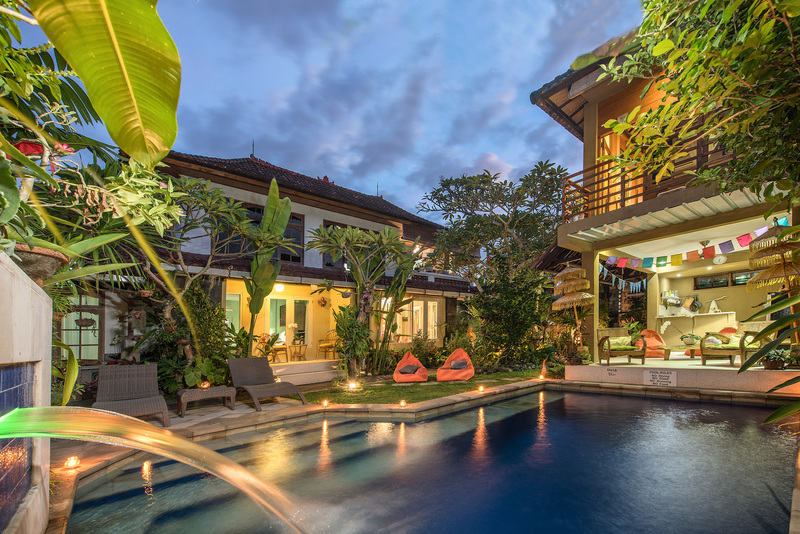 If you answer yes then Angel House Ubud is for you. You can choose either Whole Villa Rental (up to 6 adults +2 child) or rent each suite separately. The air-conditioned and fan cooled bedrooms feature custom designed, handcrafted furniture, fine Balinese linens and soft furnishings, digital security box, reading lights and tea and coffee making facilities plus unlimited filtered drinking water. Private, luxurious and safe. Angel House is set behind a walled tropical garden with pool, yoga space, bale/gazebo as well as a guest kitchen. LGBTQ friendly villa. **Sandat suite with king bed, large flatscreen TV and DVD library + 1 sofa bed which converts to a double bed (suitable for children under 10 sharing parents room), private entrance & veranda. **Jepun with 1 x Extra King size bed (220cm x 200cm) OR 2 king single beds (110 x 200cm) Perfect for families or friends travelling together. This room comes with flatscreen TV and DVD library and tea & coffee making facilities. **Lumbung suite set apart from the main villa, with Queen bed, draped mosquito net, wooden walls with traditional Bedeg (woven ceiling), enclosed ensuite bathroom and private balcony. The wide opening windows allow cooling breezes and sunrise views from your comfy bed. ** Lovely local Balinese staff PLUS Angel House driver available. Angel House is set in a tropical walled garden in the traditional Balinese village of Mas Ubud (home to woodcarvers and mask makers). We can share our experience living in Bali and guests can participate in an authentic Bali experience from Blessings at the famous Pura Taman Pule Temple (our local) learn to make Canang Sari (Balinese offerings) Balinese cooking or anything else our guest would like. We can offer a massage on arrival from our in-house massage therapist, a cooked meal or airport pick-up. A stay at Angel House can be anything you want it to be – honeymoon, a cosy couple’s escape, a week of sun, fun and shopping with friends, or a group booking with all 3 suites (Whole Villa Booking) for a family or special event. We are a short stroll to quality restaurants, coffee shops, money changer, traditional market with night stalls, woodcarvers and homeware shops and the tourist village of Tarukan Mas Ubud. Short stroll to local supermarket, ATM, art galleries and hospital with pharmacy and 24hr Emergency department. We also strive to be Eco Friendly and compost all organic waste, and recycle. Guests receive a free cloth shopping bag to help in our desire to reduce plastic bag use. Coconut smoothie bowl with tropical fruit. Relax with our professional therapeutic massage service. Organic, locally sourced and delicious breakfast.